Join CODEPINK co-founders Jodie Evans, Medea Benjamin, Chicago Area CODEPINK (CACP) and Committee for a Just Peace in Israel & Palestine (CJPIP) in our efforts to educate the public about Israel RE/MAX policies in Palestine with an exciting action TONIGHT! For the past few months CODEPINK has been protesting at RE/MAX in Oak Park, asking them to pass on our message to RE/MAX's CEO that RE/MAX must stop profiting from Israel's illegal occupation of the West Bank and East Jerusalem. This Friday (today) at 5:00 we will be protesting with CODEPINK founders Jodie Evans and Medea Benjamin while they are in Chicago for the People's Summit. We want to keep up the pressure on the local RE/MAX realtors and we want them to know that other RE/MAX offices in the U.S. have been targeted. 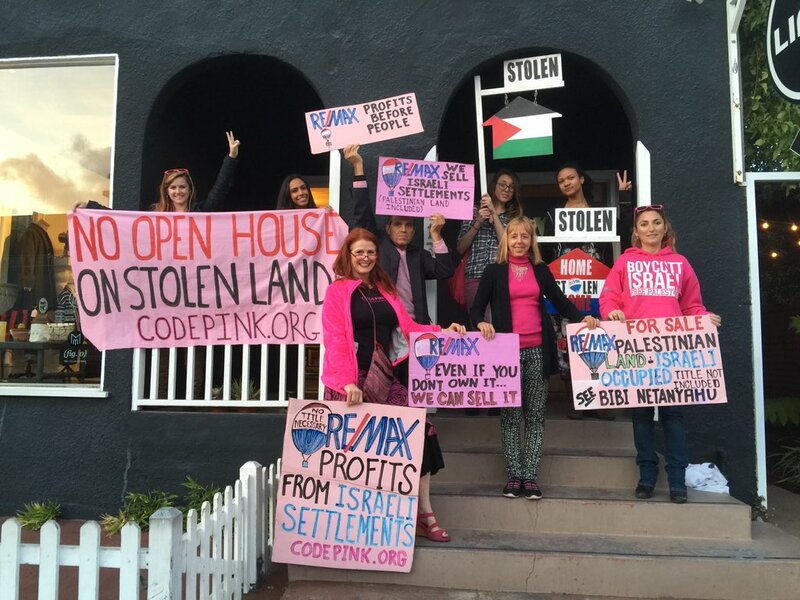 To learn more about the campaign to get RE/MAX to stop selling homes on stolen land, check out CODEPINK's Remodel RE/MAX page. Jodie, Medea, Pat, and the rest of Chicago Area CODEPINK!